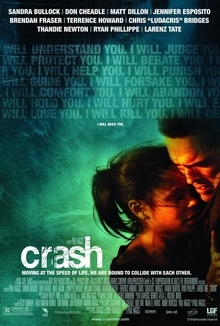 Crash has not fared well with many film enthusiasts, perennially finding itself listed as among the worst Best Picture winners of all time. Some are especially harsh on Crash given the films it beat out, but that conversation is for another time. Here, I look at the film independent of its status as a Best Picture winner. Having seen Crash for the first time since its release, a good distance of fifteen years, I find myself asking, 'How did Crash end up even getting nominated for Best Picture, let alone win'? Crash could do with a Venn Diagram to sort out all the connections our characters have despite some of them not actually meeting. We have a myriad of stories connecting all these disparate characters so I'll do my best to sort them all out. Los Angeles Detective Graham Walters (Don Cheadle) and his partner in more ways than one Ria (Jennifer Esposito) are at a crime scene where a body has been found. Their car was also hit from behind by an accented Asian woman whom over the course of the film we find is named Kim Lee (Alexis Rhee). Ms. Lee hurls racist comments at the Hispanic Detective Ria, who in turn openly mocks Lee's accent. We then shift to 'yesterday'. Racist L.A. cop Officer Ryan (Matt Dillion) and his rookie partner Hanson (Ryan Phillipe) pull over Cameron (Terrance Howard) and his wife Christine (Thandie Newton). Despite Cameron being a successful television director, he is still 'driving while black', so he's an open target. Worse, Ryan gropes Christine during his 'investigation'. Ryan also has issues with his ill father and is openly hostile that the black health insurance administrator Shaniqua Johnson (Loretta Devine) won't help. Over at another part of town, philosophical Black Power carjacker Anthony (Chris 'Ludacris' Bridges) and his more happy-go-lucky partner in crime Peter (Larenz Tate) have pulled off their latest carjacking after Anthony goes on a verbal tear about how 'white people are terrified of two young black men because they are two young black men'. They unwittingly carjacked the L.A. District Attorney Rick Cabot (Brendan Fraser) and his wife Jean (Sandra Bullock). Back at home, Jean goes into more racist hysteria, demanding that the locks be changed a second time become she's convinced the Latino 'gang member' locksmith will make copies so his 'homies' will break in. Said Latino locksmith Daniel (Michael Peña), who loves his daughter, has another client who is just as paranoid as Jean. That would be Farhad (Shaun Taub), an Iranian shopkeeper who berates Daniel for telling him he needs a new door rather than a new lock. Farhad keeps going on about he needs to 'fix the lock' and is either unable or unwilling to understand the lock itself is not the problem. Needless to say, his shop is broken into, with terms like 'rag head' sprayed inside for good measure. Now Farhad, unbeknownst to his more Americanized daughter Dorri (Bahar Soomekh), spends the rest of Crash hunting Daniel down with his new gun to avenge Daniel's supposed ineptness. In the course of this day, we find all sorts of goings-on. Graham finds that what appears an open-and-shut case about yet another 'racist' cop killing a black undercover officer may not be so open-and-shut but is pressed by the D.A. 's office to go along with the official story to get D.A. Rick good publicity. Jean has a fall and finds that the only person who is willing and able to help is her Hispanic housekeeper. Anthony and Peter accidentally run over someone they keep calling a 'Chinaman' whom they leave at a hospital due to Peter's intense pressure. They also attempt another carjacking, this time hitting Cameron. This causes two problems: Anthony, who takes pride in never attacking 'his people', now is willing to break that rule but now the mild-mannered Cameron finally breaks down and strikes back. It's only through the intervention of Hanson, who is part of the squad that chases the vehicle, that Cameron can walk away. He might have run if he knew that Hanson's now-former partner Ryan has saved Christine from a car crash that nearly killed her, leaving both Ryan and Christine confused. Hanson ends up giving Peter a ride but kills him in a racially-motivated panic. Farhad nearly kills Daniel but unbeknownst to him Dorri had given her father blanks. Dorri is also a doctor who does the examination of Peter, whom we discover is not only the victim from the beginning but is also Graham's brother. The 'Chinaman', who is really Choi Jin Gui (Greg Joung Paik) ends up being Kim Lee's husband, and she was rushing to find him when she crashed into Graham and Ria. Couple of more twists: Choi, we find, is really a human smuggler, the van he was about to get into when Anthony and Peter ran him down full of Cambodians. Anthony opts to take the van and release the Cambodians in Chinatown rather than sell them, and as he leaves, there's another fender-bender involving an Asian man and a black woman who starts hurling insults. That black woman is Shaniqua Johnson. It's amazing how in attempting to give a Crash plot summary and be as brief as possible I end up sounding ridiculously excessive. It's just that Crash has so many stories running through it that attempting to give all the stories a summation takes an awful long time. I figure that writer/director Paul Haggis thought he was saying something profound about not just the interconnection of all people but of how racism is everywhere. However, what I found was that Crash was far too convenient in all those interconnections and so over-the-top in its portrayal of racism that it ends up cartoonish and at times hilarious. Haggis' background is in television, which makes me think that Crash was somehow close to a television series jammed into a feature. We have all these stories floating about with characters that share a sometimes tenuous connection that sometimes just don't work. I think it is because almost all the characters do not resemble real people with their contradictions and at times even semblance of reason. Take Bullock's Jean for example. It's one thing to assume that Daniel with his tattoos, shaved head and swarthy looks is a gang member. It's another to be shouting it to where you think she wants him to hear her rant. There's no sense to such things. If she and Rick had had this conversation in their bedroom perhaps it would have made sense, but her ranting and raving about her paranoia practically to his face seems more hilarious than real. I found Bullock's whole performance comical and could never take her serious. Pretty much everyone in Crash seemed to be less acting and more standing in and saying things, never bothering with subtlety or realism. The only actual performance was Dillon, but he had the benefit of having something of a backstory that puts his racism in some kind of context. There's no reason for racism, let alone excuse for it, but Crash gave Dillon's character via a monologue with Devine a story that details how he got to his state. Everyone else though just was racist because the script told them to be. Worse, some of the performances showed no emotion. Esposito for example seems unnaturally calm given that a) she was hit from behind and b) a crazed woman is hurling racist insults at her. Even her mocking of Lee's accent by wisecracking about her 'blake' (meaning 'brake') seems shockingly calm, odd given that as a police officer she would have endured worse. Crash has virtually no pleasant people: even the Asian couple who could have had a nice moment end up being human traffickers. Here I'm going to digress to ask one of those pesky questions on logic. I've been criticized for focusing on details in films, such as when I was berated for not declaring Get Out a turning point in cinema because I focused on why there were candles in the operating room. However, I could not help wondering about those Cambodians being smuggled. How did Anthony fail to notice that there was a group of people in the van? Could he not smell them given that essentially they had been left in a van all day? If I understand Crash, Anthony and Peter carjacked the Cabots in the previous evening and then Anthony returned to the van after his second carjacking (that of Cameron) failed spectacularly. That in itself is bizarre given that despite taking Anthony's gun away from him Cameron never mentioned in his meltdown that there was another man in his car who had threatened him. However, after Anthony and Peter are separated when the Cameron carjacking flops, Anthony is forced to take a bus and then spots the van from the night previous. Remembering the keys were left at the door, he takes the van. Am I to understand that a van with keys in the door was never looked at by anyone in the neighborhood, or that a group of people would meekly wait all day inside the van without food or water and never shout for help? This seems something that would happen only because the plot wants to give in a last-minute twist, not any sense of reality. Haggis hammers the racism over and over again, the message more important than the delivery; he also loves to transition from one story to another via visual cues such as one door closing in one story and opening to another. There is a cacophony of stories bouncing around to where all appear to be short-changed. Crash seems less a cohesive whole than a set of vignettes on race and on how every person is racist, with no sense of compassion or kindness or even sense. Its message is clear: every person is one bump from turning into a genocidal terrorist. Crash is heavy-handed, almost condescending in its idea of how pervasive racism is. It spins so many stories that it soon tangles itself in odd knots (after her dramatic crash, Christine is pretty much forgotten to where I forgot she was in the movie, let alone that she had survived a car explosion). Far too convenient and pleased with itself on its pseudo-insight, with bad performances save for Matt Dillon, Crash has aged poorly; it would probably be forgotten if not for its Best Picture win, and in hindsight one wonders how that happened.